The Italian Anna Piaggi has a resemate what takes your breath away. She worked first as a translater, but soon moved on to fashionmagazines as the Italian Vogue and Vanity. By her eccentric and exuberant apperance among other, Piaggi was welcome guest during the fashion weeks. A lot of big names though highly of Anna, like Karl Lagerfeld and Manolo Blahnik. Manolo even referred to as 'modern Piaggi beyond belief' and 'the world's last great authority on frocks'. 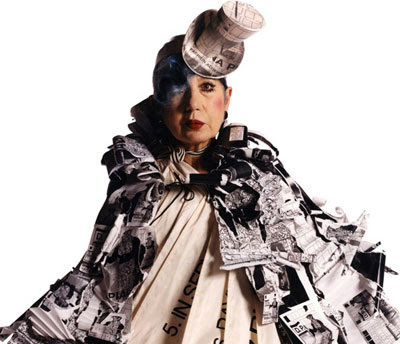 Anna Piaggi has a grandiose wardrobe of almost 3000 dresses and a collection of 300 pair of shoes (!). A part of the collection was exhibited in 2006, called Fashion-ology, in the British Victoria and Albert Musem.